The Left soft button displays the "View" dialog. Either scroll or use the number keys to choose which objects and overlays to display. 5 Ecliptic The ecliptic is the great circle on the celestial sphere that lies in the plane of the earth's orbit. 6 Messier Displays and hides the 110 Messier and 109 Caldwell deep space objects. 7 Orbital Paths Displays and hides the paths for the inner solar system bodies. The paths are draw for one year, centered on the current star chart date. 8 Polar Grid. Displays and hides a grid through the north and south celestial poles. 9 Zenith Grid. Displays and hides a grid centered on the zenith point of the observer. 0 None. Hides all of the above objects. * Show Info. Show and hide information on the selected object. # Show Time. Show and hide the date and time. The OK/Action button shows the key menu and switches to full screen. Click it again to hide the menu. Further clicks toggle between object selection and scrolling modes. Activate the main menu by pressing the right soft button. Controls the zenith point used when drawing the star chart. You can either select a city from the list or enter the latitude and longitude manually. The first entry in the Cities list is "Custom" and is automatically selected if the latitude or longitude fields are manually changed. Areas of the earth currently experiencing night are shown in darker shades. Controls the time at which the star chart is valid above the selected Location. Realtime. If checked, continuously update the star chart with the current Smartphone time. If unchecked, you may specify a particular time using the date and time fields. UTC. If checked, the time selected is in Coordinated Universal Time (UTC). Otherwise, time is entered as local time using the offset from UTC established by the following fields. System - Uses the time zone established by the device clock. This is controlled by "Start.Settings.Date and Time". Longitude - Uses the current geographical location (specified in the Location page) to calculate Zone Time. While correct for many locations, this method does not take into account the effect of political boundaries. Custom - Enables a list box which you can use to set the Time Zone. DST. If checked, indicates Daylight Savings Time is in effect. Displays a planisphere from any position on earth at any given time. Press the OK/Action key to switch to full screen mode and display a list of keyboard shortcuts. Press OK/Action again to hide the shortcut menu. Subsequent OK/Action key presses toggle between "scrolling" mode and "selecting" mode. The "." (period) key rapidly toggles between 2D and 3D modes. Displays a view of the solar system from locations other than earth. Zoom moves the viewing location toward and away from the sun. Scrolling rotates the viewing location. Press the OK/Action key to switch to full screen mode and display a list of keyboard shortcuts. Press OK/Action again to hide the shortcut menu. "Selection" mode is disabled in 3D view.. Displays the phases of the moon for a selected month. The full, new, (and blue if available) dates are shown. Illumination percentage for the selected date is shown at the bottom of the dialog. Use the left and right arrows to increment and decrement by one day. Displays the rise, transit, and set times for all solar system bodies. When the Sun is selected civil, nautical, and astronomical twilight is also shown. Let's you step forward and backward in time. First select the unit of time by which you wish to increment and decrement. Then select "Step +" or "Step -" to move forward or backward by that unit. This is especially effective in 3D Orrery mode to note the relative planetary positions over time. Controls the minimum brightness of stars displayed on the chart. Positions any of the 8 compass points at the top of the chart. Also allows reversal of east and west. Home - Zenith Remove all scrolling effects so that the stars directly overhead are positioned at the center of the display. Zoom factor is set to 1.5. Note that a green X marks the zenith point directly overhead. Flip East and West. If checked, the star chart is flipped along the North - South axis. Leave this option unchecked if viewing the computer display in-line with the sky. For example, leave this option unchecked if lying on your back with the screen overhead. If checked, the display is mirrored along the North - South axis, switching the positions of East and West. 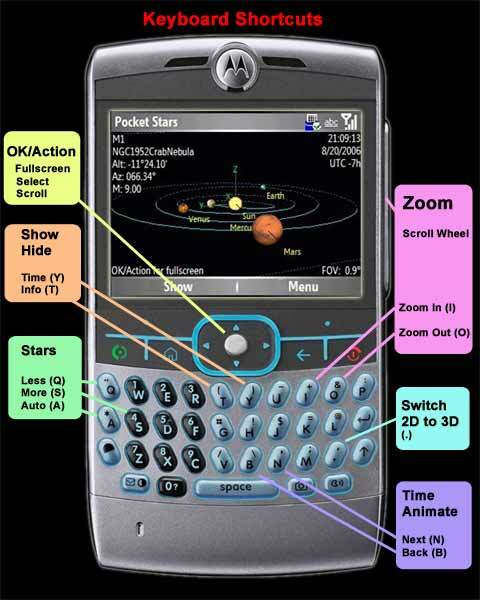 Used to select a star, planet, sun, moon, constellation, or Messier and Caldwell object. The selected object will be centered on the star chart if currently visible and Done is chosen. An image of the object is displayed if available. Choose "Info" to show a text description of the object. Messier and Caldwell images can be downloaded automatically if you have an internet connection to your Smartphone (either phone network or ActiveSync). If not, you can download the images files manually from this page. Select the ARM processor. Checking the "SDSS" displays images from the Sloan Digital Sky Survey if you have an internet connection. You can zoom in and out using the "+" and "-" buttons. Note that SDSS does not cover the entire sky: most objects in the range M80 to M100 are within the survey. The "Info" menu choice switches to a detailed listing of measured and calculated values pertaining to the body. Controls display options for the primary star chart. Black (best in dim ambient light). If checked, the star chart background is black. White (best in bright ambient light). If checked, the star chart background color is white. Red (preserve night vision). If checked, the display colors are changed to shades of red to cause minimal loss of night vision. Star chart Time format Controls how time is displayed in the upper right corner of the star chart. Use the "#" key to toggle display of time. Local Time. The full time and date will be displayed. Local Sidereal Time. The abbreviation "LST" will appear under the time. UTC. The abbreviation UTC will appear under the time. Greenwich Mean Sidereal Time. The abbreviation "GMST" will appear under the time. Small Fonts. If checked, a smaller font is used for displaying information on the star chart. Alt/Az (else RA/DEC). If checked, Altitude and Azimuth are displayed on the main star chart. Otherwise, right ascension (RA) and declination (Dec) are displayed. Pocket Stars SP is being localized into a number of languages. If a given language has been downloaded or pre-installed, it is immediately available for selection. You can dynamically switch between installed languages without restarting the program. To download additional languages, press the "Download language" button if connected to the internet. A few features (such as display of the date and time in a format appropriate for a given location) will not be available until you also change the location at Start.Settings.RegionalSettings. Displays a dialog to enter the Registered Name and Registration Code. This permanently unlocks demo version and converts it to the full version. If you have an internet connection, press the "Click to purchase online" to visit a website to purchase a registration code. If you are having problems with the registration process, please visit this page. Displays the version number of Pocket Stars. A Green X is used to mark the zenith point directly overhead. Use the * or "T" to show and hide the name, identifier, coordinates, and magnitude of the selected object in the upper left corner. Use the # or "Y" to show and hide the star chart time in the upper right corner. You can edit the file \My Documents\Pocket Stars\PocketStars.txt to change a variety of default settings including colors for all of the star chart elements.